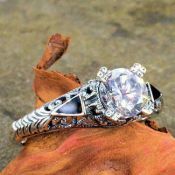 The semi set engagement rings in this section are for center mounted gemstones that are between 5.5mm (.63 carat) and 7.0mm (1.25 carat) in size and weight. Special note: it is more important to know the millimeter diameter of your stone for a proper fit than the carat weight. Fits a 5.5mm gemstone or .63 carat round diamond with 4) 1.5mm accents (center stone not included in price but available as an optional purchase). 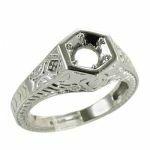 Cast to order using molds of actual antique rings or original hand carved dies and available in 10k, 14k, 18k, palladium & platinum. Fits a 6.0mm gemstone or .75 carat round diamond with 6) 2.4 to 2.7mm accents (center stone not included in price but available as an optional purchase). The sides of this setting have an intricately embossed flower and foliate pattern. Cast per order and available in 10k, 14k, 18k, palladium & platinum. Fits a 6.5mm gemstone or 1.00 carat round diamond with 6) 2.4 to 2.9mm accents (center stone not included in price but available as an optional purchase). The sides of this setting have an intricately embossed flower and foliate pattern. Cast per order and available in 10k, 14k, 18k, palladium & platinum. Fits an 6.5mm round shaped stone (stone not included in price but available as an optional purchase). Accented with 10) .015 carat micro pave set diamonds. Cast per order using and available in 10k,14k, 18k, Palladium & platinum. Fits an 7.5mm round shaped stone (stone not included in price but available as an optional purchase). Accented with 10) .015 carat micro pave set diamonds. Cast per order using and available in 10k,14k, 18k, Palladium & platinum. This is a fabulous embossed Art Deco reproduction semi set ring fits a 6.0mm round gemstone with cobalt blue enamel accents (center stone available as an optional purchase). A pave' diamond studded cathedral semi set engagement ring which takes a 7x5mm .90 to 1.10 carat oval shaped diamond (center stone not included) The band is engraved with a classic woven wheat pattern with diamond accented shoulders. 4.5mm to 5.5mm round semi set engagement ring base for a .33 to .60 carat round diamond (center head and stone not included) with .90 cttw diamond accents. 5.5 to 6.3mm semi set engagement ring setting for .75 carat round diamond (center stone not included) with .50 cttw diamond accents. Optional matching wedding band. 5.5 to 6.0mm semi set engagement ring setting for a .75 carat round diamond (center stone not included) with .25cttw white & yellow diamond accents. Shown pictured with optional matching wedding band. 5.7 to 6.0mm semi set engagement ring (center stone not included) with diamond accents.